Schools out for Easter in Dundee over the first 2 weeks of April. Make the most of the break with a visit to Scotland’s largest indoor laser tag arena, at Scotkart in Dundee. 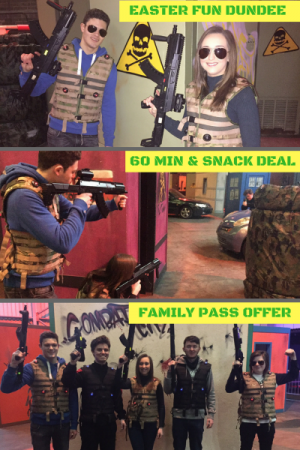 Your laser tag experience includes being kitted out with your choice of tagger from the armoury, are you going to choose the small UZI, the assault rifle, the shotgun or the sniper weapon? The taggers fire a harmless infra red beam, which registers a hit when it makes contact with a sensor on your battlefield vest. Over the Easter School Holidays in Dundee the Combat City battlefield arena is open 7 days a week, from 12Noon until 9pm midweek, and 10am until 9pm at weekends. 2. Easter Holiday Combo Deal only £15pp including 60 minute session, jumbo hot dog and can of soda. Prior booking advised on 0141 641 0222.